Explainer: what's meningococcal meningitis and what are the signs? Meningococcus (Nisseria meningitidis) is type of bacterium that only occurs in humans. It is found living intermittently in the nasal passages of about 20% of people completely without symptoms – with peak carriage in young people. For a reason that’s still unclear (perhaps because of genetic make up), in certain people, it finds its way into the bloodstream to cause a severe infection of the fluid that surrounds the brain – also known as meningitis. In meningitis, the meninges – the membrane that surrounds the brain – becomes inflamed due (usually) to infection. About 5% to 10% of patients die and a further 10% to 20% survive but are left with significant disabilities. The bacterium is transmitted mainly through droplet transmission (such as sneezing) and has an incubation period (the period before the person shows signs of illness) of up to seven days. This is the reason people with suspected meninigitis will be placed in isolation when hospitalised. The bacteria come in several “serogroups” (A, B, C, W-135, X and Y make up the majority of cases) – subtypes that have slightly different structure – but all cause meningitis. Serogroup B is the most common in Australia. Meningococcus has the ability to invade cells of the upper nasal passage and then, through several proteins, cause a severe inflammation of the meningeal tissue surrounding the brain. The bacteria also have the ability to evade the body’s immune system, making it harder to fight infection. This is why certain patients with deficiencies in their immune system and who have had their spleen removed are at increased risk of fatal meningococcal meningitis. The reason for higher likelihood of infection in late winter and early spring isn’t known, but it is thought to be related to infection at the same time by other organisms such as influenza or mycoplasma (the bacterium that causes pneumonia). During the winter months, people spend more time in confined spaces together, which could also contribute. The disease can occur at any age, but is particularly common in young children and young adults. Just like other forms of meningitis, it presents with fever, severe headache and later on confusion. What makes meningococcal meningitis quite unique is that it’s often associated with septicaemia, where bacteria enter the bloodstream and can potentially be fatal very quickly. Patients will present with low blood pressure, a typical purplish rash and muscle aches, vomiting and mottling of the arms or legs. These are all critical signs and people should seek urgent medical help. Medical staff may suspect a diagnosis based on clinical examination and will proceed to make the diagnosis by sampling the cerebrospinal fluid that surrounds the brain and spine. This is done by placing a needle between the vertebrae in the lower back to access the area around the spine where the fluid is situated. While awaiting the results of the sample, medical staff are likely to commence antibiotics to cover the infections they suspect including meningococcus. If the patient has developed septicaemia and is critically ill, they may need admission to an intensive care unit to support the function of their organs while the infection is treated. Sometimes the severity of the septicaemia may cause damage to the tissue and the patient may be left with significant disability and require rehabilitation to regain as much function as possible. Prior to 1988, the medication of choice was penicillin, administered in high doses through the intravenous route. After isolating penicillin-resistant meningococci, the medication of choice has been a different antibiotic (ceftriaxone) administered in high doses intravenously. Since the infection is so dangerous, people who come into close contact with the patient before they are isolated are given antibiotics to prevent them from getting infected. There’s a 0.4% chance of cross infection without antibiotics. This should be done as soon as possible after the patient is diagnosed. The public health department is notified of the case and will ensure adequate advice and follow-up of people coming into contact with the patient. There is a vaccine available against meningococcus although the different vaccines do not cover all of the subtypes. This is because certain subtypes are very uncommon in Australia so the different vaccines are designed for specific purposes. For example the “4vMenCV” covers several subgroups and is recommended for people travelling to places such as Africa and Asia, and pilgrims to the Haj. 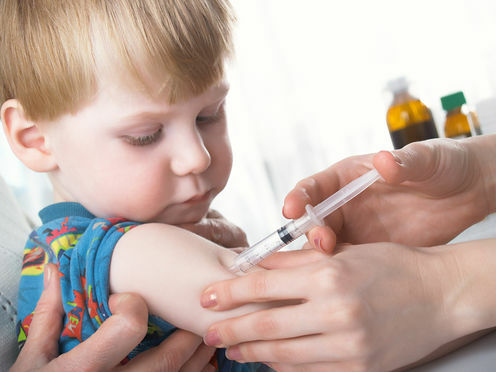 In Australia, meningococcal infections caused by strain C are the most common and are vaccine-preventable in all age groups, including babies and young children. The highest rate of meningococcal disease occurs in children under five years of age, although this has decreased since the introduction of the free meningococcal C vaccine under the National Immunisation Program. Vaccination for meningococcus subtype C (usually in the form of Hib-MenC) is given at 12 months of age. Meningococcal meningitis is a life-threatening infection, so if your child has fevers, an intense headache, nausea or vomiting or a purplish rash or mottled skin, seek medical help immediately or call an ambulance.